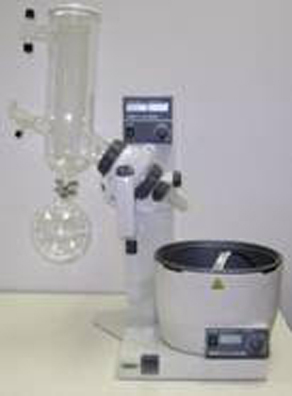 A rotary evaporator ideal for routine distillation, complete with vertical water coil condenser. 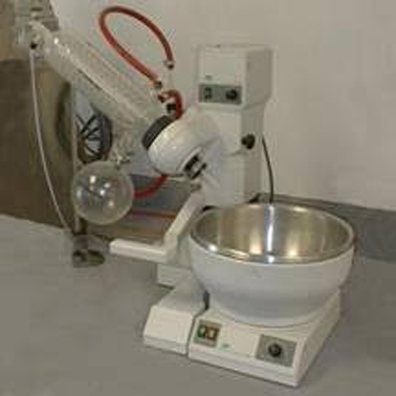 With a two piece cold trap condenser the Buchi Rotavapor R-200 system is perfect for low boiling solvents. This rotavapor system also features an internal motorized hydraulic mechanism to assist users with the raising and lowering of samples and compounds. A digital display exhibits all necessary data to the user at all times with sharp visibility. The Buchi R-205 Rotavapor System is considered to be the most desired high-end rotary evaporator on the market and is known for its versatility and reliability. The R-205 features a rotation range of 20 to 280 rpm, an automatic height adjustment switch, and an average power consumption of 120 watts. You can process samples from 50 mL to 3 L with this system. The Buchi V-800 vacuum controller has a reading range of 0 to 1400 millibar and a regulation range of 1 mbar/torr to atmospheric pressure. Ideal for distilling volumes. Vertical set-up.